mARAy iNaindha maRudham iRath thavazhndha: The inseparable, twin “yamalArchanam” trees that regarded krishNa as its enemy, was made to fall down in the ground by krishNa who crawled in between them. YashodhA went to take bath in Yamuna river after leaving krishNa in HIS bed. krishNa was crying out of hunger at that time. His mother who used to feed HIM with her breast milk was not there in the vicinity at that time. krishNa was very upset that HE did not get any food when HE was hungry. So, HE kicked out HIS legs. When HE kicked, HE kicked a wheel nearby. There was an asurA who was inside that wheel. The asurA was destroyed by the mere little kick of krishNa. This happened earlier. Similarly, the twin “yamalArchanam” trees who became such trees in the first place due to a “sAbam”, were destroyed completely due to krishNa’s actions. krishNa had stolen butter from others’ homes and had eaten them fully. Not able to listen to others’ complaints of krishNa’s mischief, YashodhA tied HIM up to a mortar and went on to do her chores. 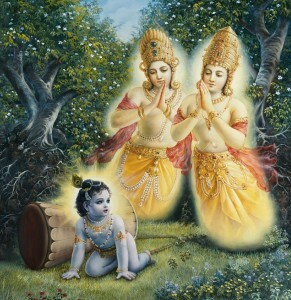 krishNa was still a small kid and hence did not know what to do. HE went ahead and crawled with the mortar as well. He was stuck in between the twin trees as HE could not go through them. The mortar could not penetrate through it as it was too wide. krishNa forcefully tried to enter. HIS divine thighs rubbed against the trees because of which the twin trees broke down completely and fell to the ground. The asurAs who were inside the tree were killed. YamalArchams tried to kill krishNa and help kamsA by residing in the tree. However, they were destroyed by krishNa HIMSELF. Hence, even though one opposes krishNa for the sake of others, they would eventually need to succumb to krishNa. Whoever be the enemy, krishNa will destroy all of them. sERAr aravindhach sEvadiyai – HIS lotus feet has the hue of a fresh lotus that has just blossomed in a pond midst a natural settings. “sEvadi“ generally refers to “red hued” color of HIS feet. However, it is not just the red coloredness. It also means the associated characteristic beauty of HIS feet that includes beauty, coolness, fragrant etc (as per the thamizh grammar “yaerpuli kodal”). Swamy parAsara muni (author of srIvishnu purANam) describes this event and when he did that, he glorified the beauty of krishNa’s red eyes, when HE turned HIMSELF back with the mortar to look at the tree that had just fallen on the ground. However, swami aruLALa mAmuni, instead of describing the red hued eyes, here described the red hued LOTUS feet of krishNa, explains swami Manavaala mAmunigaL in his commentary for this pAsuram. Even azhvAr wanted to enjoy the LOTUS feet with which HE crawled between the twin trees (“ponnAy maa marudhin naduvE en pollAmaNiyE”). vERAga uLLAdhAr – this refers to those people who regard these two divine LOTUS feet as the ultimate enjoyment and do not pay any heed to other stuff. When krishNa killed the asuras in yamalArchanam trees, HIS true devotees will feel delighted because HE saved HIMSELF from the clutches of those demons. Not only that, by saving HIMSELF, HE gave HIS lotus feet to HIS devotees for their enjoyment. Hence, true devotees will always think about those LOUTS feet that had saved HIMSELF. They will never turn their attention to any other mundane stuff. However, not all people are HIS true devotees. There are many people who are involved in mundane material benefits. These people are being referred to as “vERAga uLLAdhaR”. thAn uvandhu koLLAn malar madandhai kOn- krishNa, who is verily sriman nArAyaNan, is known as “Thiruvukum thiruvAgiya selvan”, i.e., “HE gives “Thiru” to even the periyapirAtti”. Hence, HE is replete with everything and does not need anything from anyone to make HIMSELF complete in any aspect. Hence, these people who indulge themselves in materialistic pursuits, even if they offer the highest of the highest wealth, HE will not take it with full heart. Had HE been an “incomplete” person in the first place, HE would have gladly accepted with highest satisfaction those enormous wealth that those people offer. Since HE is “complete in every sense”, we cannot say that HE will accept those wealth with HIS heart content. Moreover, HE accepts with full heart based on with what thought a devotee offers. Since it is being described as “HE accepts those wealthy offerings of other people but not with full satisfaction”, we can infer from this that “HE accepts it still but will treat it just for the sake of it to accept it and no real happiness behind it”. God is ONE who everyone is dependent on. Hence, HE has to take all that anyone offers. However, if one gives it with full heart’s content, HE accepts it with an even more full heart’s content irrespective of what is being offered to HIM. This is similar to how parents accepts everything that one of their good natured child gives and at the same time accepts anything that their other children with not so good nature offers.